My pal Bill has had a week's holiday and needless to say he went fishing a few times. After catching a fish the other morning he rang me to ask if I fancied joining him for an hour or two the next day so of course I said yes. He picked me up just after five a.m. and we drove to the coast. When we arrived it was still pretty dark because there was heavy cloud cover so we needed the headlamps to walk along the shore to our chosen spot. The tide was still well out and sure enough, as we approached an area of flat rocks we saw signs of fish. 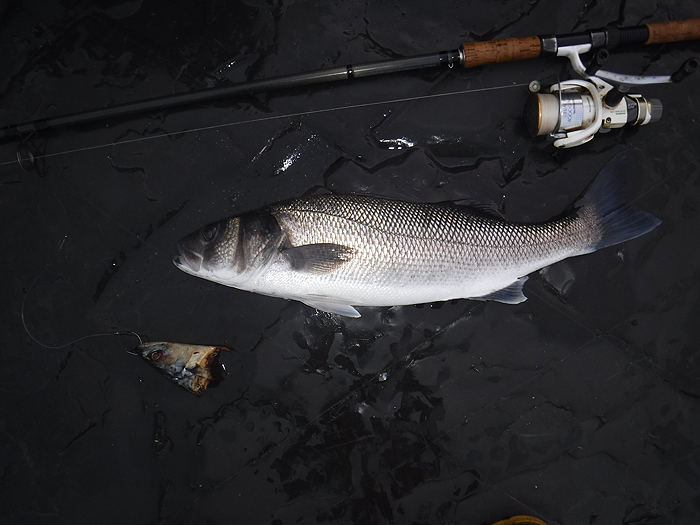 Now it may be hard to believe but the water was only inches deep, a foot at the most, over the flat ledge but apart from the occasional flap of a tail or swirl the bass (which were a decent size) managed to remain invisible. 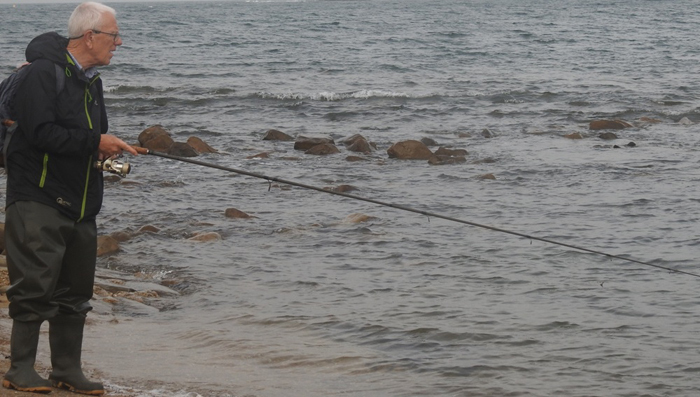 It just shows how easy it would be to scare good fish away by wading even ankle deep. We stood well back from the water's edge and watched until we managed to locate the position of a fish (or possibly two or three?). Bill suggested that I should have a cast with my big Slug-Go but I wanted to see how he approached the fishing so I persuaded him to have a go with the weighted, white Evo Stix lure. He flicked the weedless lure a few metres beyond where we'd seen the fish and began to retrieve and as the soft plastic reached the critical spot (about two metres from the edge) there was a sploosh and his rod jerked round but the fish wasn't hooked and it shot away followed by a few choice words. We fished on and not long afterwards Bill who was now just to my left had another bite and this time he hooked it. 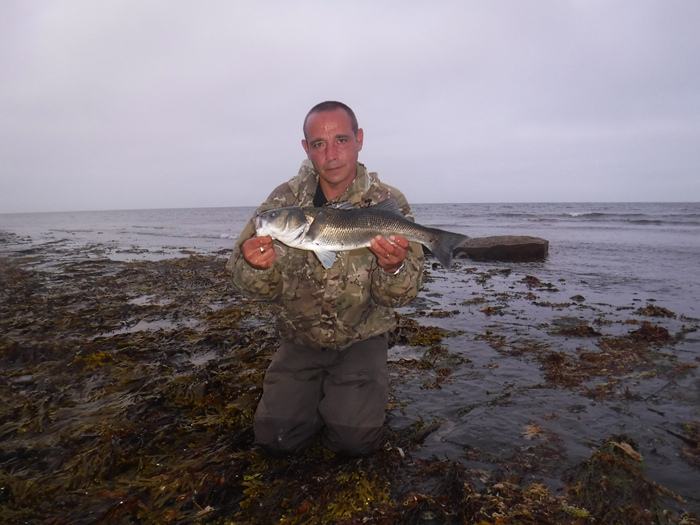 It was a reasonable bass, nicely hooked and after a short battle it measured 56cm - excellent stuff! The tide was pushing in fast and although we flogged away there were no more signs of active fish as the water deepened. Neither of us was keen to get a soaking on the return walk so we packed in and made our way back to the car park and breakfast. As we drove home we discussed what the fish were doing in such shallow water over an apparently featureless ledge - as I said it's just flat, smooth rock clothed with patches of grey green algae looking a bit like 'fuzzy felt'. There didn't appear to be any substantial item of bass food present so it was a mystery why the fish were risking such shallow water. To judge from the occasional waving tail and emphasised by the fact that Bill has caught a couple of fish on his lures the bass are certainly intent on feeding. That night I replaced the lure on my old Surespin with a 6/0 circle hook and took a head-and-shoulders bait out of the freezer to thaw. I set the alarm for the same time as the previous day and went to bed. As I hiked along to the 'hot-spot' there was a little more wind than on the previous morning and the tide was a bit further out but sure enough, as I approached I saw a couple of swirls in the shallow water. I impaled a bait lightly through its chin and snout, found myself a handy boulder to sit on and flicked the bait out somewhere close to the action. To my amazement it was no more than ten seconds before I felt the line tweaked from my fingers and it began to run swiftly out to sea. I stood up and waited until the fish had taken perhaps twenty metres and it was still racing away when I closed the bale arm. Now, having missed every run I've had so far this year I was apprehensive but this time the clutch began to screech and the rod bowed round to the the pull of a well hooked fish. 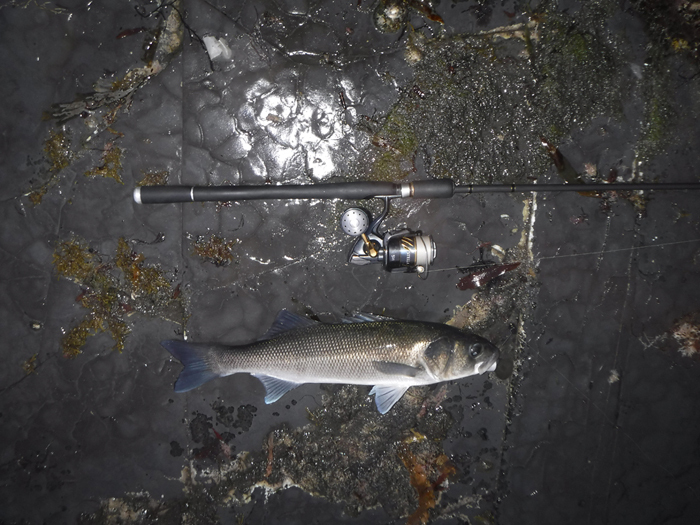 I capered about on the slippery rocks as I tried to shorten the distance between me and the fish but it was only a matter of time until I was able to slide the bass into shallow water and pick it up. Bill took this picture of me spinning on the first morning. Bill's bass caught on an EvoStix lure. Bill with his catch. Note the flatness of the rocks. The next day I had this one - almost exactly the same size as Bill's, on my head and shoulders bait. – PLEASE TELL YOUR TWITTER, FACEBOOK, EMAIL FRIENDS ABOUT THESE BOOKS.